Every summer, Salzburg's historic centre is in an unusual state of affairs, lasting several weeks – and this has been going on for nearly 100 years. The red carpet is rolled out, VIPs gather and music fans flock from all over the world to experience one of the most important classical music festivals in the world – it's Festival time in Salzburg. Probably the most famous cultural event in the Salzburg region is the Salzburg Festival from July to the end of August. The artistic program is diverse at the Salzburg Festival, as well as interesting and exciting. Every year around 180 events, including operas, concerts, evenings with plays and readings are held in Salzburg. The city of Salzburg becomes a stage for art and culture. Drama: From Everyman to Shakespeare to contemporary plays. Opera: The focus is on operas by Mozart and Richard Strauss. Concerts: From solo performances on the piano to small ensembles through to the best orchestras in the world. 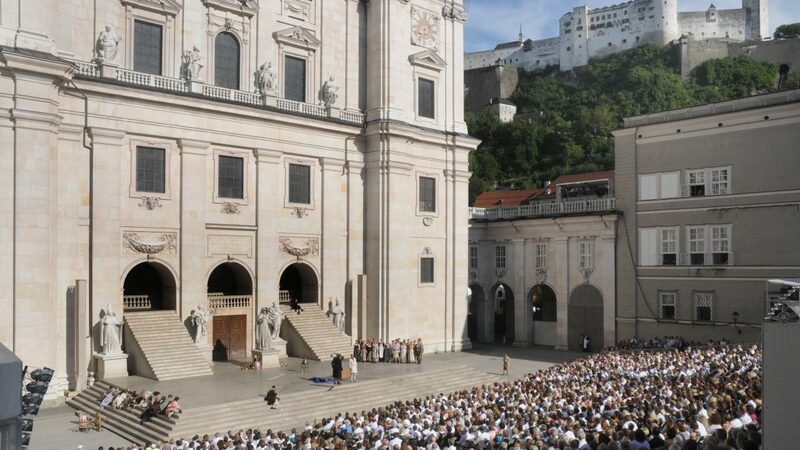 The Festival was born in 1920 when Everyman (Jedermann) was performed in front of the cathedral for the first time. To this day, “The life and death of a rich man” is still performed – and with good reason, too. Every new production is an exciting and independent highlight of the Festival, celebrated year after year by locals and visitors alike. Find out more about the turbulent history of the Salzburg Festival. Herbert von Karajan, also born in Salzburg, dominated the Salzburg Festival from the 1960s to the end of the 1980s. He initiated the Easter Festival and the Whitsun Festival. While the Easter Festival has music of the highest quality but on a smaller scale, Whitsun quickly became the “alternative date” for the Easter Festival subscribers. Over the years, both festivals have gone through many changes and are now regarded as the spearhead of classical music as well as the most exclusive and best festivals in the world. The summer is characterised by the artistic program of Markus Hinterhäuser. The whole program can be found on the page of the Salzburg Festival. While some people are putting on their evening wear, others are working frantically to ensure everything runs smoothly. While some people are sitting in coffee houses, having a quick look at the libretto of the Mozart opera that evening, others are still rehearsing and adding the finishing touches at the Festival Hall. While some people are stuck in traffic and are complaining about the stifling heat, other people are already gathering at the Everyman stage in front of the cathedral. It is obviously Festival time and there are certain things you have to be aware of. Well begun is half done here, too. Go to the Festival district in the historic centre and experience it before or after a performance at the Large Festival Hall for yourself. Well begun is half done. A stress-free visit will help you concentrate on what's important – enjoying the operas, plays and concerts. Herbert von Karajan founded the Salzburg Whitsun Festival as an extension of the Easter Festival. Cecilia Bartoli is the current artistic director of probably the smallest and most exclusive classical festival in Salzburg. Salzburg has made a name for itself as a festival town. Apart from the Festival in summer, the Easter Festival is one of the most elitist and best classical music festivals in the world. It is celebrating its 50th anniversary in 2017.